Over the past 30 years, the Arctic has warmed more than any other region on Earth. As sea ice continues to thin and melt, understanding the rapid changes going on in this sensitive part of the world and its ecosystems becomes even more crucial. The new vehicle, called Nereid Under Ice (NUI), is remotely operated by pilots aboard a surface ship via a lightweight, micro-thin, fiber-optic tether, which relays in real time environmental data, including high definition imagery of what the vehicle “sees” as it explores, maps, and gathers data beneath undisturbed sea-ice away from the disruptive impact of an ice-breaking research ship. This real-time view allows scientists to direct the vehicle’s path and collect data of interest based on their visual feedback. 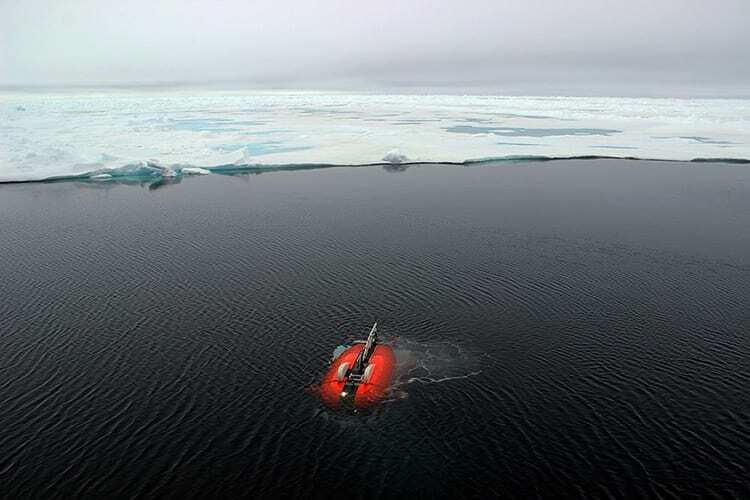 The approximately $3 million vehicle, which was developed with major funding from the National Science Foundation and WHOI, was tested in July 2014 on a scientific expedition aboard the Alfred Wegener Institute’s ice-breaker Polarstern, which has the ability to access thick ice. “We already know the Arctic is changing on an unprecedented scale, and now we have a proven vehicle that provides a completely new way of looking at that system,” said Chris German, one of the project’s principal investigators at WHOI and the lead scientist for the NUI dives in the Arctic. If the tether breaks or becomes entangled, NUI is designed to operate as a free-swimming, autonomous vehicle. As part of its ‘come home’ control system, the vehicle routinely reports its status to the ship via underwater acoustic telemetry. “Its human operators can then remotely pilot NUI back to the ship by sending it a series of vehicle motion commands to enable the vehicle to safely return to the ship,” said Louis Whitcomb, Professor of Engineering at Johns Hopkins University who is both a principal investigator on the vehicle design-and-build project and sailed to the Arctic with NUI this summer. 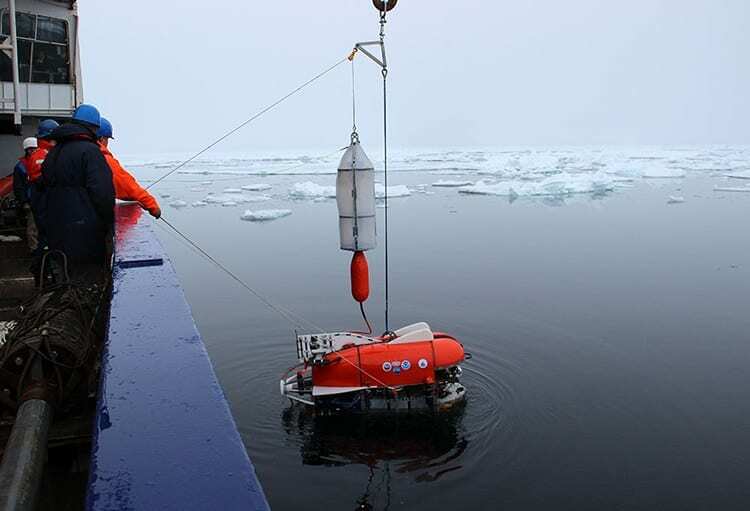 Without an ice-capable robot, past Arctic studies have primarily relied on samples gathered from lowering instruments off the side of an icebreaker research ship. During its trials off the Polarstern this summer, the vehicle made four dives, to a maximum depth of 45 meters. More importantly, the distance of the dives ranged up to 800 meters away from the ship and NUI completed up to 3.7 kilometers of track-line surveys under moving sea ice. The dives provided scientists with an abundance of optical, physical, chemical, biological and visual data, which will be the focus of continued study, particularly looking at the extent to which photosynthesis can occur in an ice-covered ocean and how that varies as melt-ponds form and the ice thins. One of the surprises the team noted about the dives was the unexpectedly high amount of biological productivity found under the ice. They observed large concentrations of algae (single-celled organisms), copepods (tiny, shrimplike crustaceans), ctenophores (comb jellyfish), and larvaceans (transparent, gelatinous animals). The tethering system for Nereid Under Icewas originally developed during the design of the unmanned deep-sea robot Nereus, which made a historic dive in 2009 tothePacific Ocean’s Mariana Trench—the deepest part of the ocean. Nereus, which was also designed and built by a team of engineers at the Deep Submergence Facility at WHOI and counted among its successes helping to explore the world’s deepest vent-sites on the Mid Cayman Rise (2009-2013), was lost in May 2014 while working as part of a mission to explore the ocean’s hadal region from 6,000 to nearly 11,000 meters deep. Major funding for this summer’s expedition aboard the Polarstern was provided by the National Oceanic and Atmospheric Administration’s Office of Ocean Exploration and Research and the Alfred Wegener Institute (AWI). The expedition was also part of the Helmholtz Alliance program called the Robotic Exploration of Extreme Environments (ROBEX). Nereid Under Ice is remotely operated by pilots aboard a surface ship via a lightweight, micro-thin, fiber-optic tether, which relays in real time environmental data, including high definition imagery of what the vehicle "sees" as it explores, maps, and gathers data beneath undisturbed sea-ice away from the disruptive impact of an ice-breaking research ship. The Nereid Under Ice vehicle is launched from the Alfred Wegener Institute's ice-breaker Polarstern during an expedition last summer.